It’s Wimbledon fortnight and what food do we associate with the world’s finest tennis tournament? Why, strawberries and cream of course. All the juicy ripe strawberries in the supermarket were tempting me and I grabbed a couple of punnets to whip something up in the kitchen. Lekue, who make fantastic silicone bakeware, cook and kitchenware had recently sent me their Duo Silicone and Ceramic 6” springform mould. 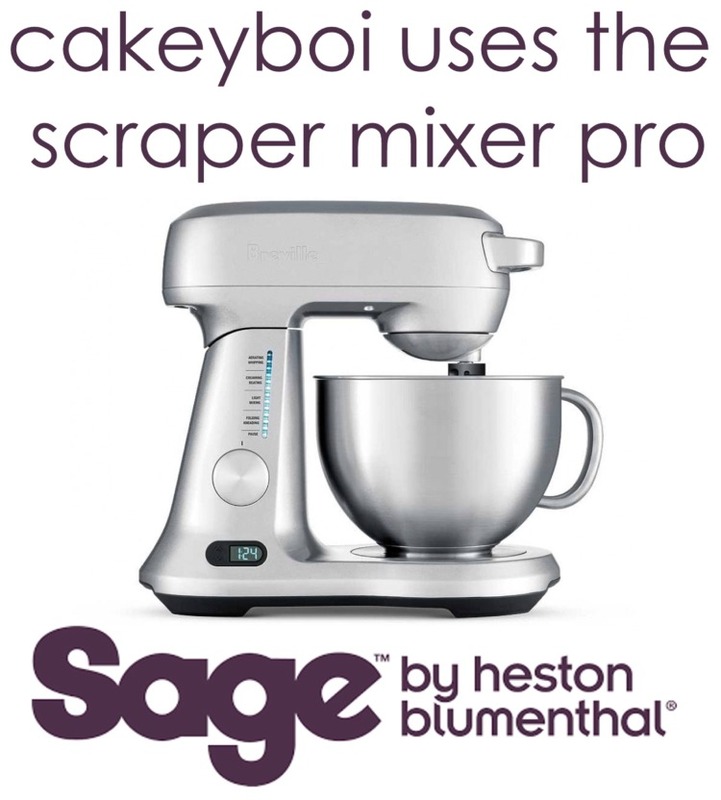 This would be perfect for something which compromised a Victoria sponge, a Frasier cake and some Eton Mess. Hence the name – when Victoria met Frasier and went to Eton. I decided to layer whipped cream folded with crushed meringue, strawberries, sandwich this between two layers of Victoria sponge, with strawberries around the outside, a nod and a wink to Frasier Cake. I decided to make some little meringue kisses too, to decorate the cake on top, along with more strawberries. Mum was coming up for dinner and I thought this would be the perfect cake to make, and would make good use of my new springform mould. I set about making a basic Vicky sponge using the 4 ounce method (4 ounces each of butter, sugar and flour, plus two eggs). I could bake directly in the mould which comprises a ceramic cake plate, perfect for serving on, and silicone edges which can be peeled easily afterwards. When the cake had cooled, I split it into two and place the bottom half back in the (now washed) mould. I then cut strawberries in half and placed these around the cake with the pointy bit up the way. I dolloped in the freshly made Eton mess, which I’d used shop-bought meringue in, along with some strawberries I had macerated with sugar. I smoothed this over with an off-set spatula and placed on the second layer of cake, pushing down gently. I dolloped more Eton Mess on top and then placed this in the fridge to chill, until ready to enjoy. Just before we had dinner, I removed the silicone edges and revealed the gorgeous edges of the cake and adorned the top with more strawberries and the meringue kisses I had made. This cake was soooo good and a perfect summer treat for a sunny day with a glass of Pimms on the side. Here’s how I made it. Macerate 100 grams of chopped strawberries by mixing them with the tablespoon of sugar. Leave for a few hours, stirring occasionally.Preheat the oven to 90C and line a baking sheet with greaseproof paper.Make the meringues by beating the egg white with an electric mixer until stiff peaks form. 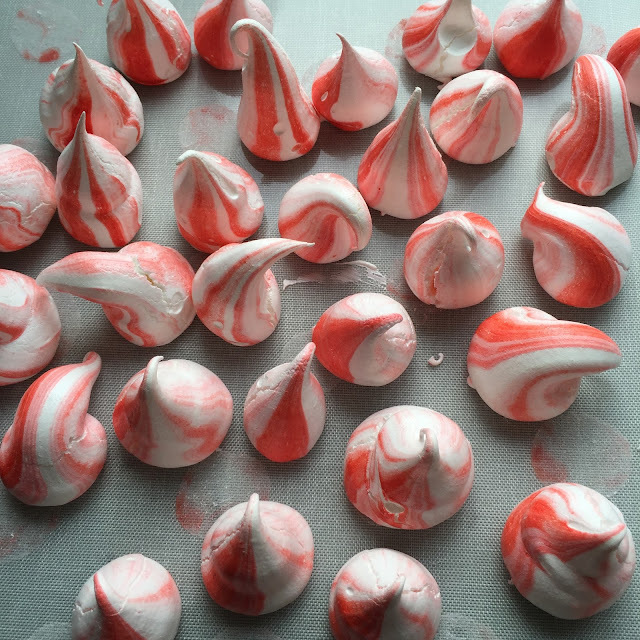 Add the sugar a little at a time and continue beating for 5 minutes.With a toothpick, streak lines of red food colouring up the inside of a disposable piping bag.Transfer the meringue mix into the piping bag, snip off the end and pipe little kisses onto the baking sheet. Bake in the oven for 40 minutes, remove and let cool.To make the cake, grease and line a 6” springform mould with greaseproof paper and preheat the oven to 180C.Beat together the butter and sugar until pale and fluffy. Add the eggs one at a time and beat to incorporate.Fold in the flour, being careful not to overmix.Pour the batter in the mould and bake for 35 to 40 minutes or until a toothpick comes out clean from the centre of the cake.Allow to cool for 5 minutes then release the edges and transfer the cake to a cooling rack. Once cooled split in two.Make the Eton Mess by beating the double cream until thick. Crush in the meringue nests and add the macerated strawberries, stirring through to combine.Gather around six strawberries of the same height, cut off the top and cut in half. Place these pointed side up around the edge of the cake. You may need one or two more strawberries, depending on their size.Dollop in around half the Eton Mess and press down with an off-set spatula, ensuring the strawberries around the edges stay intact.Place the top half on the cake and press down gently. 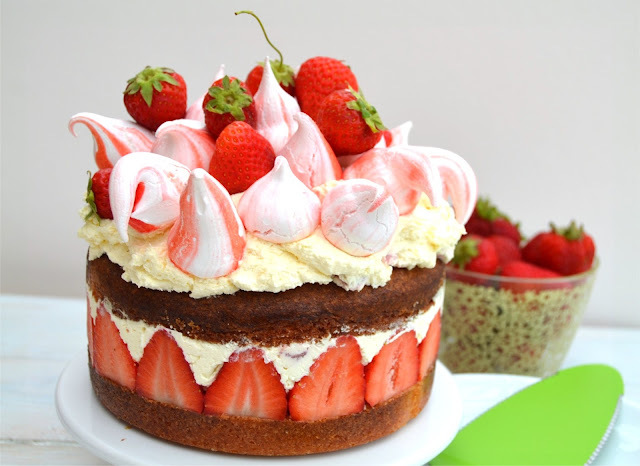 Spread the remaining Eton Mess on top of the cake and chill until ready to eat.Just before tucking in, remove the mould and decorate the top with the homemade meringues and more fresh strawberries.Enjoy! 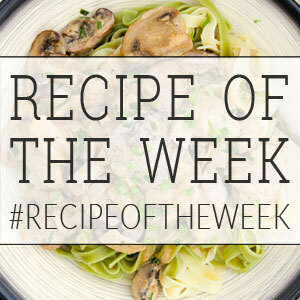 I'm entering this cake into this week's Recipe of the Week, hosted by Emily over at A Mummy Too. Disclosure Statement: I was sent to Lekue mould free to review. Any opinions expressed are my own. Thanks Cath, it is a bit!! This cake may be very British, but I can see this working for a U.S. Fourth of July celebration too because of the colors (minus the blue) and the shapes of the meringue suggesting fireworks. Beautiful cake. I'm sure it's tasty too. That's very kind Susan, thanks for stopping by! Looks divine Stuart. Bet your Mum loved it! She certainly did - she's a sucker for anything with fresh cream and strawbs! Thank you Sammie - I loved the way the meringue kisses turned out. Wow this cake is so impressive looking! I love it! And it's perfect for this time of year too. That is such a beautiful cake. I love eton mess, but it is a bit of a mess (obviously haha), so this looks nice to serve up to guests. My goodness, this looks amazing and I like how you used the mould again to shape the filling!